Bandhavgarh National Park is situated amidst the Vindhyas mountain range in Madhya Pradesh. The famous white tigers were first found in the Bandhavgarh National Park. This national park was earlier a hunting reserve of the royal family of Rewa. Maharaja Venkat Raman Singh has earlier hunted about 111 tigers. Bandhavgarh was declared as a national park in 1968 and extended in 1986. 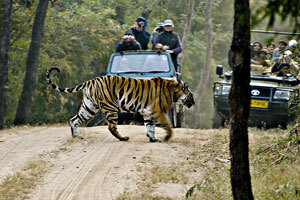 Bandhavgarh national park was declared as a tiger reserve in 1993. The famous storywriter Rudyard Kipling found inspiration for his famous book, the Jungle Book in Bandhavgarh National Park. Bandhavgarh National park covers an area of 448 square km. Within the park, stands the Bandhavgarh Fort, believed to be about 2000 years old. The fort is now in ruins and its monuments and tanks are being gradually reclaimed by the forest, which provides shelter to various wildlife animals including Blackbuck. 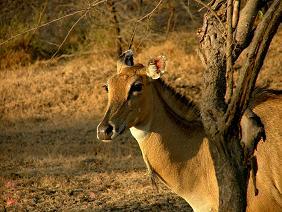 From the top of the Bandhavgarh Fort one can have a breathtaking view of the Park and also view the Blackbuck. 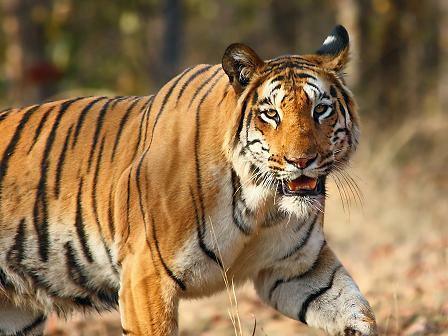 About more than 40 tigers are found in the Bandhavgarh National Park. The park is home to about 22 species of wildlife animals like Regal Gaur, Jungle Cat, Rhesus Macaque, Nilgai, Chital, Chinkara, Sloth Bear, Four-horned Antelope, Deer, Striped Hyena, Fox, Jackal, Leopard and Wild Boar. About 150 species of birds known from the Tala area are also found here. You can visit the park either by having an Elephant or a Jeep Safari. A guide will always accompany you during the safari in the park. Besides the jeep or elephant safari you can also move around in the park in the private vehicles. The best season to visit Bandhavgarh National park is from the November and June. The park is closed during the monsoon season, which is from July to October. However the best time to visit the park is early in the morning or after 4 p.m. It is during this time that the animals are most active and can be easily spotted. The nearest airport is located at Khajuraho and Jabalpur. Khajuraho is connected by various domestic airline services with Delhi and Varanasi. The nearest railway station is located at Umaria, which is about 30 kms located on the Katni-Bilaspur section of South-Eastern Railway. Another railway station is located at Satna, which is about 117 kms located on the Bombay-Howrah main line of the Central Railway. Bandhavgarh National Park is situated on the Satna-Umaria and Rewa-Umaria highway. Bandhavgarh National Park is connected by road with Khajuraho, Varanasi, Katni, Rewa and Umaria. The regular bus services are available from Khajuraho to Bandhavgarh.